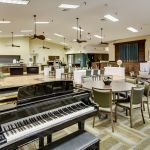 Ask fellow campers about "Emerald Desert RV Resort" and nearby attractions. This is park has great amenities and some scheduled activities. The sites are quite close but expected for its location. We lucked out by not having anyone parked beside us except for 1 night and it was a small TT so we felt very spacious. We arrived at noon and was told they would charge us an add'l $25 for checking-in an hour early. Though they didn't want us to, we just spent the hour in their check-in lane. Nice flowers, walking areas, and pool/spa. Very pretty and nice social time. We did have shade at the pool and the spa from trees and the shadow of a building. There is a 2nd adult-only pool and spa in the back of the grounds but way too small, isolated, and with a cement wall around it that in my humble opinion it doesn't count. The train is irritating but the horn was only blown once that we heard in our 9 night stay. It is close enough that our 23 tons would shake and conversation would have to halt when we were outside. Can't imagine being in a 5er or a TT with that. The sites are not particularly long. Rules say not to hang over their grass but many units have to (including us) so tow vehicles can fit on the site. We parallel parked in front of our coach and just barely made it. We made reservations last minute so we got a Premium site (bottom level). As we walked around, we could not see much difference in the Premium to the Super Platinum. Would spend the extra money. We camped at Emerald Desert RV Resort in a Motorhome. Joshua Tree National Park and Salton Sea. First let me say that this resort is a 10 if you are looking just at amenities. It is very beautiful and right now it is very green. Everything is clean and well kept. That said, check-in was not friendly. The sites are extremely short and tight. Luckily, this time of year the park is fairly empty so there is no one in close proximity to my rig. If this park were full the rigs would be very close together and most parking would have to be offsite. As I am not one who uses the amenities, I did not find this to be worth the price. We camped at Emerald Desert RV Resort in a Motorhome. Made better time than expected so started calling for reservations when got near Palm Springs area. Either facilities were closed for the weekend or didn't answer the phone so were glad to reach a real person. Unfortunately directions provided were very vague even when called the second time for more details so we were very glad when we found it. Luckily I had been given the gate code. Thankful for tall trees giving shade as it was 106 at arrival. Pool was in full sun so couldn't enjoy it. Very clean bathroom with a ledge preventing water from flowing into drying area. Only negative is train noise ongoing through the night. We camped at Emerald Desert RV Resort in a Travel Trailer. This park is amazingly clean. The first time we ever stayed here it was so dry and brown (due to the water shortage), but over the last few years it is a lot more green. Very clean and the pull thru spots are nice and private. We like the side where the pools are and not so much the overflow camping. It was fine, but we really like it on the other side. We've stayed in multiple spots and have always been happy. There is a commuter type train that runs every 10-15 minutes at times which can be annoying, however, at least it's not like a freight train that honks it's horn all the time. Our pets love it here too, some cute little fenced in dog runs. If I remember there is a large one on the side where the storage is. The pools are beautiful, there's a family pool and an adult pool, there is also tennis and golf there. I really do love staying here, unless it's like 115 degrees. We camped at Emerald Desert RV Resort in a Fifth Wheel. There's a lot of shopping within 10 minutes. There's a Target, Walmart, Sam's Club, PetCo and a Lowe's. This is so convenient to stay. Big beautiful pool. No fenced in Dog Park when we were here. They had one week before they closed for the season, so the park was fairly empty. The sites are rustic and you must play seek and find for a good one. They are long but not well kept and not even. We stay for the convenience and pool. We camped at Emerald Desert RV Resort in a Motorhome. This is a very beautiful, high-end luxury level park, and the price reflects that. The park uses an airline industry style "dynamic pricing" system that will leave you mind boggled. Supply and demand is how they will describe it, but the concept of maximum profit for the park is all that you will understand. This park has everything that you could ever desire, so we won't go on and on about that. Just know that if you aren't happy here, other than with the price, then you just plain cannot be happy. We camped at Emerald Desert RV Resort in a Motorhome. Front desk needs greater experience to handle questions...also how difficult would it be to have a matching service to match tennis and pickle ball players.....don't know if the owners care enough to look at these reviews ....I have requested this sort of thing to them in the past when at the park. As others have said....expensive during the spring and during the tennis tournament at Tennis Garden....and the train and traffic is loud in the less expensive sites. If you have a small RV you may feel overwhelmed by all the large 35-40 foot 5th wheels and class A motor homes. We mostly go to the tennis tournament in March and play tennis and pickle ball.....only one tennis court left and it is line-marked for pickleball....tennis seems to be on the way out here. We camped at Emerald Desert RV Resort in a Motorhome. First the good, it is a beautiful park with lots of green areas and trees, the trees are trimmed so there is no danger in damage and it is easy to get satellite service. 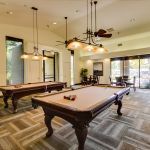 The clubhouse and pool area are nice and they appear to have a lot of activities to keep the full timers occupied. Now the bad, sites are too small in length for today's coaches. We could barely fit our 40' motorhome and car into the site. The streets are narrow and because of the small site size, cars are on the edge of the road. The trains and freeway are noisy. The checkin was awful, one person (nice) to answer the phone, check people in, and answer questions from full-timers, in a park this size this was a terrible first impression. Not worth the $100 a night for a "deluxe" site even in their busiest time of year. We camped at Emerald Desert RV Resort in a Motorhome. Had two great walks, Indian Canyon (4 miles Murry trail)and Tahquitz Canyon (2 miles). Both where beautiful and water was running in both streams. Pricey but beautiful and immaculate every where you look. Office staff is excellent. This is probably our tenth visit to Emerald Desert and have already made our 20219 reservations. One negative: The longer you ait to make your reservations, the more it will cost you. We camped at Emerald Desert RV Resort in a Motorhome. There are no tables at any site.. I have stayed at this RV Park numerous times in the past. Unfortunately the Park has a new owner and manager. The lack of experience with the personnel resulted in damage to my car hauler trailer without restitution to me. I do not recommend or will visit this RV Park again. Other RV parks to chose from. We camped at Emerald Desert RV Resort in a Motorhome. The town of a Palm Dessert is delightful. One of my favorite California cities. Three years ago we 'discovered' Emerald Desert RV Resort in Palm Desert. We were impressed enough by the facility and the reasonable rates to initiate and maintain a four month reservation for the winter seasons. Planning our 2018/2019 reservation caused us to reflect upon why we should continue to stay at Emerald Desert RV resort. The rates have have more than doubled since we first arrived three years ago (Over $2000/month for cheapest site for 2019): the WiFi is virtually non existent even though every year we had been promised it would improve - the response that for 'only $50/month' we can get Spectrum services is insulting considering what we pay: the Resort is NOT a secure facility as there is no control over access to the property (gates wide open during day): the staff, with the exception of one, are disinterested in addressing concerns or issues: 'special rates' such as Sam's Club and 'Canadians15% off' discounts seem not to apply to existing extended stay RVers: the facilities which admittedly are very well kept are minimal as are the activities offered. Noise from trains and traffic are also a detriment. Pads are small as are the roadways, making access and egress problematic. While I understand that the above observations are common to many parks, Emerald Desert is pricing itself into an 'elite/five star category' and, as such, I would expect much more and much better. Interestingly enough we have found a number of parks in this area that are, in every way comparable and in many cases definitely superior, to Emerald Desert and at HALF THE PRICE for 'long term stays'. We still like your facility here and with REASONABLE long term rates could accept the shortcomings mentioned above. I might add that my feelings are not unique as I have spoken to many with long time attachments to this park who will not be returning. Sorry to say goodbye. 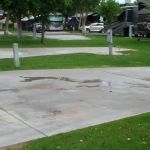 We camped at Emerald Desert RV Resort in a Fifth Wheel. Similar to other comments - service was poor and slow, especially at check in. They can't help the train and highway noise but they have control over all the machines going in the middle of the day. It's a lovely (if expensive) facility, too bad they can't sort out the service side. We camped at Emerald Desert RV Resort in a Travel Trailer. After staying for 4 years, the train noises got to us. Too many trains and whistles in the middle of the night. The tracks are adjacent to the park. 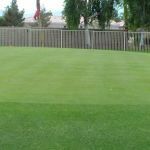 Also the excessive landscape maintenance daily is not necessary, requiring mowers, blowers, and dust. Service is a little snobby at the desk. A picnic table is not too much to ask for at these rates. When you call for reservations, the rates change daily. The quote you get today will be different tomorrow. We camped at Emerald Desert RV Resort in a Motorhome. They got rid of their golf holes. No one plays Pickleball here that we could find. Shopping is a drive away. Located in a semi-residential area next to the train tracks. Area attractions are not nearby. No sense of community unless you are with a group. I will never stay here again. First, when I arrived, I stood behind someone else trying to get a better site and the 1 lady at the desk never acknowledged me. I stood there for 15 minutes until someone else finally walked in. Next, we get to our site and it is not level. Then I start setting up and the sprinklers come on making it impossible to setup without getting drenched. Then to top it off, I see ant piles all around my site plus no bench. Not impressed especially for the price. We camped at Emerald Desert RV Resort in a Motorhome. My only tip would be to look for another park. When we arrived the temperatures were abnormally hot (over 40 degrees Celsius daily). Our first site had the trailer positioned such that it was in mostly full sun all day long and the air conditioner had a terrible time trying to cool our rig. I surveyed a couple of empty sites which had better shade and asked at the office if I could move to one of them. The happily accommodated my request and our air conditioner was able to cool much better. 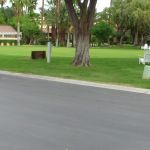 The entire resort is kept in pristine shape, although the street signs are very faded and definitely in need of replacement. A few downsides though: the noise of the trains that roar by on a regular basis, the poor wifi, and the lack of picnic tables at the sites. This still remains one of our favorite stops. 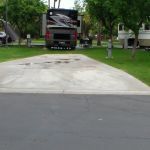 We camped at Emerald Desert RV Resort in a Fifth Wheel. There is a Wal-Mart nearby, with a large parking lot. Lots of nearby restaurants, office will give you a list on check in. Get your car washed at Executive Car Wash on Country Club and Washington - $20 for exterior, interior, tire wash and hand dry. Great value. We spent a day at the Palm Springs Tram, which was an easy 20 minute drive (one-way). If you enjoy hiking, we like the Indian Canyons that offer beautiful trails with towering palms. The Living Desert Zoo is also a nice place to visit, which is located in Palm Desert. If you have small children, we really enjoy the Children's Discovery Museum of the Desert (located in nearby Rancho Mirage). Look at the park map online and request a site as far from the train tracks as possible. If it's hot, be sure to ride up the Tram and hike around San Jacinto. Temperature is about 25 degrees cooler at the top of Tram. Wonderful amenity. Go anytime but the summer, the desert is brutal in the summer. Cold Stone Creamery close by along with small mini market. Costco with gas station, Walmart, with groceries, and a large variety of stores and restaurants within 5 mile or less driving distance. Near community college. Casinos in area too. Take the cable car up the mountain in Palm Springs. Be sure to bring a jacket. Lots of golf courses, hiking trails, shopping, and casinos. Make a visit to the Living Desert Zoo/Museum. Don't miss the swap meet at the College of the Desert. Take the Tram at San Jacinto State Park and eat at the Peaks Restaurant. Great adventure for the day. Walmart and Ralphs about 3 miles. Lots of restaurants and shopping close by. As others noted there is train noise but didn't bother us. We went on a hike at the Cochella preserve, and a 20 mile bike tour to Mecca. Both enjoyable. We used the Grand Paw doggy day care when we couldn't bring our dog. They were wonderful. There is a street fair in downtown Palm Springs every Thursday evening at 6:00 PM. Get there by 4:00 to find parking. Have drinks and dinner at the Matchbox while waiting. All American made goods. Parking is right behind the restaurant. The RV park itself hosts a farmers market every Wednesday. Also check-out the Living Desert Zoo. There is also another trader's fair every week at the local College of Desert. Too many good restaurants to mention and a lot of good shopping for the ladies. 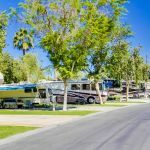 Are you affiliated with Emerald Desert RV Resort ?